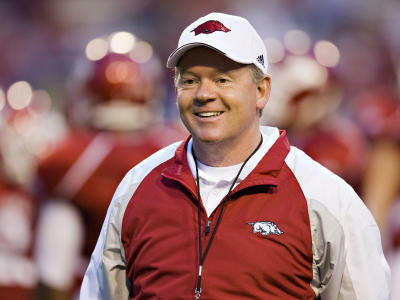 Razorback fans and everyone interested, there will be a rally in support of keeping Coach Bobby Petrino as the Head Football Coach at the University Arkansas. The rally will take place on Monday, April 9, 2012 at 7 p.m. in front of the Broyles Athletic Center on the campus of the University of Arkansas in Fayetteville, Arkansas. I have been working tirelessly with a large group of passionate and influential members of the Razorback Nation to get this event organized and to have our voices heard through many mediums. Several local media stations have already agreed to cover the rally and I’m expecting more media sources to cover the rally. We need a large, strong, and vocal crowd to come out to support Coach Bobby Petrino! Let’s shake things up! Let’s have our voices heard! To join this effort, request to be a member of “Team Save Coach Petrino” on Facebook. WOO PIG SOOIE! Supporting a man who lies and cheats on his wife and kids…..hmmmm…..do Arkansas fans really want to win that bad ? Scott, I hope you never make any big mistakes in your life, since you’re so perfect. No one agrees with what he has done. However, we just think he deserves a second chance. Why is it that we get pissed because he cheated on his wife? We don’t know what happened i’m not saying that it’s ok to do that, but when he does something that causes unrest within our football program. We weren’t there we don’t know, we can’t say anything. But it doesn’t matter what he did I want the team to win, go all the way. What conference do you want to win Scott Big 12? Jennifer, thank you! We support the great job he’s done for our program and the great job he’s done for our program has earned him a second chance. Don’t worry about Scott–he’s a perfect man who has never done anything wrong. Yes, Cecil! WOO PIG SOOIE!!! The BIG stipulation here is… this verse is not for weak minded, rock throwers. BUT Spiritual people!!! Very true, Chris! Powerful messages in that scripture!